We cheer! Gliders do not depend on the wind to stay airborne. Usually we are using thermals (see below) as our source of lift. In this case, the wind is an annoyance, like swimming upstream in a river. Safety is not an absolute. We can't promise anything is absolutely safe. Gliding is relatively safe. Unlike hang-gliding, paragliding, ballooning and parachuting, you are seated in an aircraft which has its own wheels; you won't be trying to use your feet for the landing. 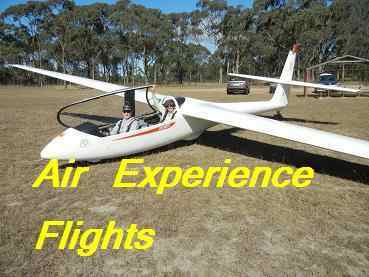 Air experience flights flights are carried out by the club's instructors in a 2-seat glider. They are trained to cope with any emergency by recognising problems before they become an emergency. The club's gliders are modern designs, built to specific flight test and airworthiness standards. They are constructed with fibreglass composite, using methods pioneered in gliders more than 40 years ago that are now also being used to construct airliners. Most modern airliners have some composite parts and Boeing's latest 787 "Dreamliner" due to fly in 2008 will be almost entirely built from composites. The club gliders are maintained in accordance with standards specified by the manufacturer, GFA and CASA. There is a system of annual inspections, daily inspections and pre-flight inspections to ensure that every glider is safe for every flight. With no engine, the engine can't fail and you can't run out of fuel. If there is a crash, there won't be a fire. A thermal is a rising bubble of warm air. The sun heats the air near the ground and creates a bubble about one hundred metres across. It is possible for a glider to circle inside this bubble and be lifted upwards. In exceptional thermals, we can climb at more than 1000 feet per minute - only jet aircraft and stunt planes climb faster. Normal climb rates are 100-500 feet per minute. If you were to fly through a thermal quickly - in an airliner - you would feel a big bump and you would probably call it an "air pocket." In a glider, we stay inside the rising bubble, where the air is quite smooth. Flying a glider is a skill anyone can learn if they want to. If you are really keen and come up every weekend, then you could be flying solo within a couple of months. Why don't you crash without an engine? Unless you are a rocket going straight up, then it is the wings which support the weight of the aircraft. The engine simply makes up for drag (friction.) All aircraft - even helicopters - are able to glide without using the engine. Of course, some are better than others. Depending on how high he is when he starts, a glider pilot may glide for more than an hour before thinking about landing. If he finds a thermal in that time, then the flight can be prolonged. Flights of eight hours or more are possible. When is the best time to glide? The best thermals are in summer, when the sun is hottest. In summer we can fly for long distances - 300km or more. If you are just taking one flight to see if you like it, then any season is good. A strong thermal can be upsetting if you're not used to the sensation. Visiting glider pilots might like to know that our "season" runs from August to May. For cross-country distance, the peak season is late October to late March. You can check out our club statistics on the Aerokurier Online Contest. What is the best weather for gliding? A perfect gliding day is a hot summer's day (not too hot) with lots of little puffy cumulus clouds. Each one of those clouds marks the top of a thermal. We need to have the sun hitting the ground to create the thermals and a thin layer of high cloud can significantly reduce the thermal activity. The best height achieved at Warkworth is 16,000 feet. There is controlled airspace above us at 18,000ft, for the airliners approaching Sydney airport. (In Australia, height is measured in feet and cross-country distance is measured in kilometers.) The world height record is over 50,000 feet. There have been several flights from Warkworth over 500km. It is possible to fly a 300km triangle without straying more than 15km from an airfield. The world record is over 3000km. There is no restricted airspace in the Hunter Valley except for two Army facilities and they're small enough to easily fly around. A Variometer is one of the main instruments we use in flight. The vario will tell us if we are ascending or descending. It uses the same air pressure changes that the altimeter uses, only it is much more sensitive. An altimeter might be calibrated in hundreds of feet but a vario can measure the difference in pressure over a height of 5cm. The other primary flight instruments are the altimeter, airspeed indicator and yaw string. Are you a glider too? No, I am a glider pilot; I own a glider.